Alan Rusbridger, editor of the Guardian, and Nick Davies, the journalist who uncovered the extent of phone hacking at the News of the World, are to be this year’s recipients of the Media Society award. The Guardian’s revelations about phone hacking at the News of the World have not only been the biggest media story of the year, but have also triggered a public debate about the practices of the press, with potentially far-reaching consequences. 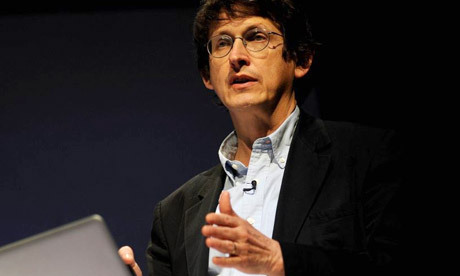 Alan Rusbridger, editor of the Guardian since the mid-1990s, has presided over the paper’s development from a broadsheet to its current Berliner format, and its embrace of online journalism. He is an eloquent defender of the importance of journalism for holding power to account. Nick Davies, meanwhile, has demonstrated the highest qualities of persistence in his following of the biggest media stories in recent years, while his concern for the health and future of his craft is manifest: he is an outstanding advocate of the importance of good reporting as the basis for good journalism. Last year’s Media Society award went to Michael Grade and the 2010 honour went to Melvin Bragg. Nick Davies has been handed several awards in the past year, including the Paul Foot Award, journalist of the year at the Foreign Press Association Media Awards 2011 and the Frontline Club award. In February it was announced that Rusbridger was to receive Harvard University’s Goldsmith Career Award for Excellence in Journalism. Rusbridger and Davies will be honoured at a Media Society dinner on 24 May. This entry was posted in Awards and tagged Alan Rusbridger, award, Media Society, Nick Davies, The Guardian on April 4, 2012 by Sarah Marshall. Alan Rusbridger, editor of the Guardian, today asked readers what they were prepared to give back to the news group in return for journalism: money, time or data. The first option, to ask readers to pay for an online subscription, “has not been ruled out”, Rusbridger told a session called “what might the Guardian’s future look like?” at the Guardian Open Weekend. He suggested readers could give their time, perhaps volunteering to work shifts when they would moderate comments from fellow readers, a suggestion that is perhaps equally as surprising and seemingly unlikely as the idea of the Guardian putting up a paywall. 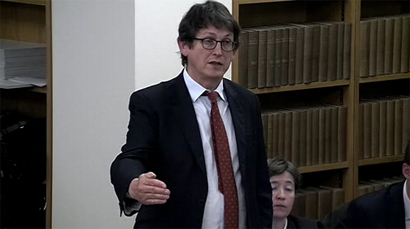 The third option Rusbridger proposed was that readers share personal data, such as their postcode. All three options aim to make or save money, helping to compensate for the “£40 million-a-year which walked out the door” with the rapid decline in newspaper advertising. You have to work on the basis that [revenue] is never going to come back. 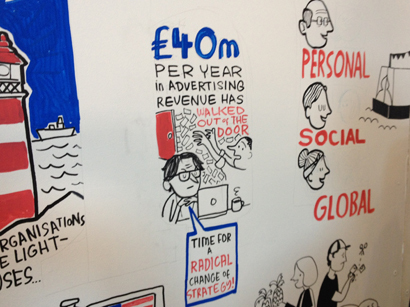 There are huge opportunities for journalism but it’s going to be a period of intense change. In the same session, Andrew Miller, CEO of Guardian Media Group, explained the group is focussing on brand building, saying sustainability via digital relies on far more than “banners and buttons”. The newspaper is fantastic product but is one of many products that people use to consume news. Miller commented on the revenue generated by the Guardian’s Facebook app, launched in September – which has been downloaded by eight million users in six months and which saw Facebook users read 19 million articles via the app last month – saying “we only make a few hundred thousand pounds” via the app. Earlier this week Journalism.co.uk reported that the Guardian app has generated more money than it cost to build. Also speaking in the session was Janine Gibson, editor-in-chief of the Guardian US operation who seven months ago “took the Guardian-ness and put it in America”. She talked about how the “audience is growing substantially” in the US. We are trying to make [the audience] feel they are part of the international army of Guardian readers. This entry was posted in Paid-for content and tagged #gdnopenweekend, Alan Rusbridger, Andrew Miller, Janine Gibson on March 25, 2012 by Sarah Marshall. 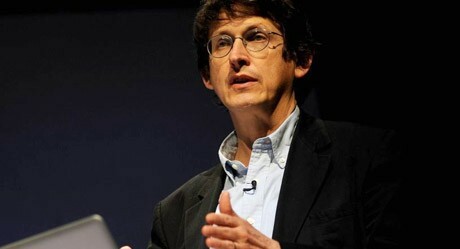 The National Union of Journalists has welcomed news that Guardian News and Media editor-in-chief Alan Rusbridger has offered to take a pay cut – and the union has called on other newspaper bosses to do the same. The Guardian reported that Rusbridger would take a 10 per cent voluntary cut in the 2012-13 financial year, from £438,900 to £395,010. His pension contribution will also be reduced. Trinity Mirror investors have expressed concern about Bailey’s pay package, almost £1.7 million in 2010. The company’s share price has fallen by 87 per cent in the past decade. This entry was posted in Journalism and tagged Alan Rusbridger, guardian, nuj, Sly Bailey, Trinity Mirror on February 10, 2012 by Paul McNally. This afternoon Alan Rusbridger has been answering questions from readers in the form of a live Q & A on the Guardian website. The post quickly gathered a heap of comments – more than pages worth, below are Rusbridger’s replies to questions about whether hacking has been going on at other newspapers, media regulation and politicians’ reactions. Question: Oborne goes on to allege you also warned Nick Clegg about Coulson’s activities. Is this true? If so, what were Cameron and Clegg told that is now in the public domain? What have they known all along? Rusbridger: Peter Oborne is right. Before the election it was common knowledge in Fleet Street that an investigator used by the NotW during Andy Coulson’s editorship was on remand for conspiracy to murder. We couldn’t report that due to contempt of court restrictions, but I thought it right that Cameron should know before he took any decisions about taking Andy Coulson into Number 10. So I sent word via an intermediary close to Cameron. And I also told Clegg personally. Question: Does the Guardian have any evidence of phone hacking happening at other British newspapers? If so, once the dust settles over NotW, will the Guardian widen its continuing investigation to these papers, too? To be frank, it’s taken him all this time to land this one, so he’s hardly had time to look elsewhere so far. Question: The past few days have had me genuinely wondering about what, if any, licensing requirements there are on running a newspaper. If a broadcaster had been up to what the NotW were doing it would quite rightly have been pulled off the air. So what exactly does a newspaper have to do to lose its right to publish in the UK? Rusbridger: I’m anxious about the notion of state licensing for the press. We got rid of that more than 150 years ago (date, someone?) and I wouldn’t want to see it back. In an age when anyone can call themselves a journalist I see difficulties of definition. Would Huffington Post have to get a licence? So, I think it’s probably unworkable as well as undesirable. But I’d be interested to hear other views. Read the full thread of comments and questions here. This entry was posted in Journalism, Newspapers and tagged Alan Rusbridger, guardian, phone hacking on July 7, 2011 by Joseph Stashko. Press critic, writer and professor of journalism at New York University, Jay Rosen, presented eight specific points within his presentation titled The Great Horizontal at #media140 today. He described the ‘great horizontal’ as when people are connected across to other people as effectively as they are connected up to “big media”. You can see each of his points Tweeted from his Twitter account which can be viewed here. This entry was posted in Journalism, Online Journalism, Social media and blogging and tagged Alan Rusbridger, Jay Rosen, Media140 on April 13, 2011 by Rachel Bartlett. Last night Journalism.co.uk was at the Press Awards, where the Guardian was named Newspaper of the Year. 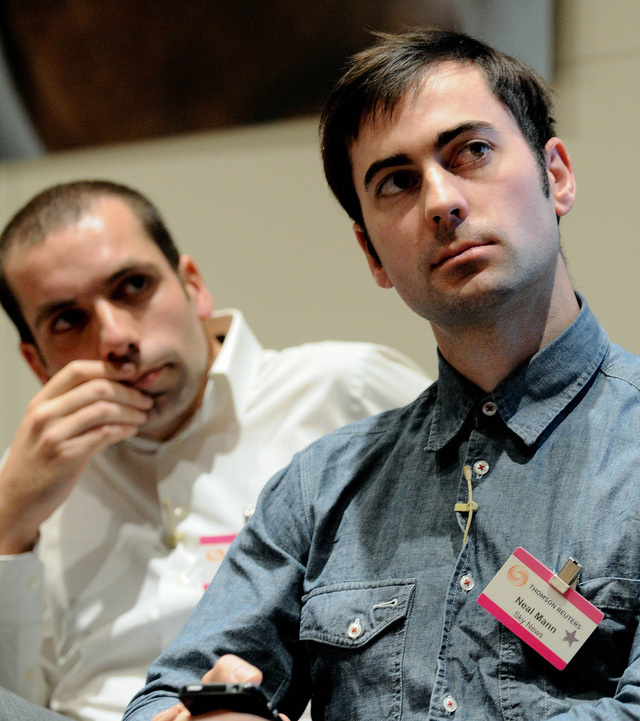 At the ceremony the paper was praised specifically for its its coverage of the WikiLeak’s releases. We caught up with Guardian editor-in-chief Alan Rusbridger at the end of the awards, who said that while the current situation with WikiLeaks is “difficult” there will be more revelations to come. I think WikiLeaks was the stand out story, not only nationally but also globally. I think it had a global impact and I think it will be historically significant. I can’t think of another story in my lifetime where a story created by a newspaper has become the most discussed thing in every capital city around the world. That was the stand out story. At the moment things are quite difficult between WikiLeaks and the Guardian, because they just are, partly due to the communications. It’s very difficult to keep relation with people if you never see them and the only way of communicating is through encrypted text messaging. I think there will be more revelations to come and I think lots of papers are going to be developing their own mini versions of WikiLeaks. One thing WikiLeaks has taught us is the importance of working out how to get information securely and publish securely and I think that’s been a valuable lesson for us all. You can see the full list of winners from the Press Awards here. This entry was posted in Awards, Editors' pick and tagged Alan Rusbridger, Awards, Events, guardian, Press Awards, Wikileaks on April 6, 2011 by Rachel Bartlett.